Kodansha is one of the largest digital publishers for manga and their North American branch just announced all of their new titles that will debut in 2018. At the New York Comic Con the team expressed the importance of digital releases, noting that it gives them the ability to offer fans more diverse manga and gives them insight into what series might warrant physical publishing down the line. You can buy these titles from many different online retailers, but if you have an e-reader Amazon and Kobo both have an extensive selection of manga from Kodansha. Again!! (Mitsuro Kubo) – From the co-creator of the overwhelmingly popular Yuri!!! on Ice comes a Groundhog’s Day-type story about a kid who goes to sleep a graduate and wakes up a freshman again. Available February 2018. Tokyo Trarareba Girls (Akiko Higashimura) – The latest from the creator of Princess Jellyfish is another honest look at the female experience, this time starring 33 year old Rinko, who decides she needs to get married before the 2020 Olympics. Available summer 2018. 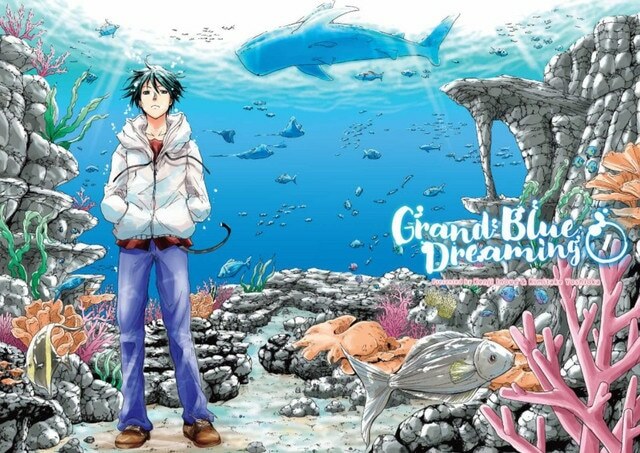 Grand Blue Dreaming (Kenji Inoue and Kimitake Yoshioka) – A boy heads off to college in a seaside town and stumbles into the Grand Blue Dive Shop full of beautiful women. A haram-type manga, but one which the editors described as funny and basically just “boys drinking.” Available summer 2018. To Your Eternity (Yoshitoki Oima) – An intimate, emotional drama spanning time and space, available this month. The logo of the U.S. version is a paper cut done by a Japanese artist, who also created the logo for the Japanese release. Pop Team Epic (Bkub Okawa) – Debuting in the U.S. next fall 2018, this manga follows the daily adventures of two 14 year old girls, Popko and Pipmi. Kodansha described it as “South Park meets Power Puff Girls meets Animaniacs,” which is as good of a description as I’ve ever heard. The Delinquent Housewife! (Nemu Yoko) – High school student meets his sister-in-law, who moves into the family’s house. A series for anyone who’s ever had to deal with their in-laws. Hana-Monogatari and Otori Monogatari – Two new editions to the Monogatari series, available in June and August 2018, respectively. These will also include new covers for the U.S. release.